Not far behind Mad Max is a far more modest endeavor, the low-budget British thriller “’71,” a pulse-pounding picture with a message. 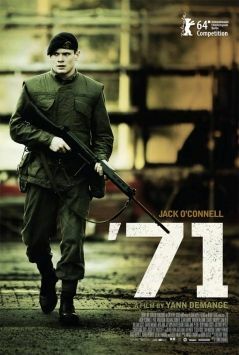 The feature debut Yann Demange strands Jack in the midst of enemy territory in Northern Ireland in the 1970s which is a target for both Irish Republicans and nefarious higher-ups on his own side. The suspense in the movie is spot on but it’s not just a stripped-down genre exercise. Gregory Burke’s amazing allows you to take a break for a breather to give a nuanced take on the politics of the time or to further locate the humanity in the men and women around them. Both realistic and strangely hallucinatory, it’s easily one of the most striking debuts in some time.